- (5-27-17) Maya is doing well. No new eggs that I can see, granted, she is almost always on top of the pile guarding them at this point. Onyxia is up to six eggs! She seems to be doing well so far despite her gaster dent. My Tar Heel Ants "Atom C" founding formicarium arrived today too. I was excited, but noticed it had a bit of an odor to it, like paint or something. Erring on the side of caution, I've been letting it air out under my fan (since I have no idea what the things are made out of). I plan on letting Maya move into it once it no longer worries me. Not a huge deal, since I'm patient. Onyxia will have to remain in a test tube set-up for the time being though, since I wasn't expecting to acquire a second queen. She doesn't seem to mind though, and I'd like to make sure she'll even survive in the longer term first before getting anything fancier. Might just do the thing where I put her tube in a critter carrier outworld if she manages to get to the worker stage. I also noticed a darn odor! Mack claimed it is harmless, but even after weeks of waiting, the smell stressed my ants to death! And it was my only colony! There's a reason I will no longer be buying any more THA formicaria. I'm lucky in that I let mine air out, but to take a week was ridiculous. The outside still smells slightly, but the inside is fine. It's cool though, it's given me the motivation to learn how to make my own, which I've been doing. Also, hope you find your dream ant someday. To be honest, I just got lucky with my Camponotus. A lot of it comes down to luck, really. I did find my dream ant a few days ago. Trapjaw queen. She might need some males, but I will get some tonight. Thing is, they're not native, I'm just on vacation. So, I'll see what I can do. - (7-9-17) Maya's second nanitic eclosed late in the night. She's still getting her bearings. Her mom and older sister are taking good care of her. I have a feeling I might be seeing a third in a day or two, as there's still one more very dark pupa left. I have a small outworld ready for them. I'll set it up tomorrow once the new little one is steady on her feet. I made mini-outworlds for all my test tube colonies (except the solenopsis, cause I'm afraid they'd escape). It's much easier to feed them now. The Lasius umbratus queen is still trying to convince the Lasius workers I found that she's in charge. It's been a struggle. She's still getting attacked from time to time, and one of her antennae has been injured, but there haven't been any deaths yet either. You'd think for a queen that has a big head and mandibles for fighting back, you'd think she'd put them in her place, but she's kind of a wimp. Haven't seen her even try and fight back once. 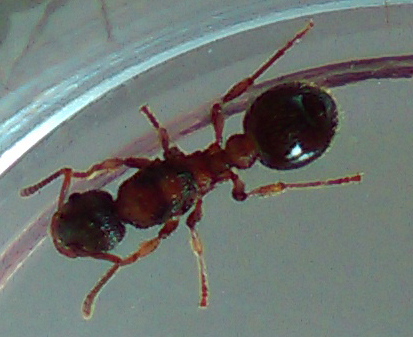 Still wishing I could find brood, but for as many Lasius worker ants I've found, I can't seem to find any. I found a food the Solenopsis like. Canned dog food. They went right for it. Guess that'll hold them over til I can order some fruit flies for them (I have to wait til payday on Friday). Meanwhile, trying to feed the Ponera has proven difficult. I've looked up what they eat, but no luck getting them to eat it so far. I left some pre-killed prey in their new formicarium I made (a mini-bead container version), and I'll see if maybe they pick at it overnight. Wish they'd have taken to the cut-up mealworms. Oh well. I'll go hunting for other small bugs they might like tomorrow too. Still trying to figure out a formicarium solution for the Solenopsis. I was gonna use a bead container set-up til I realized they'll be able to fit in the part where the bead containers screw together. They're THAT small. x.x In the meantime, they're confined to their test tube. If I can't think of anything, I'll probably sell them. 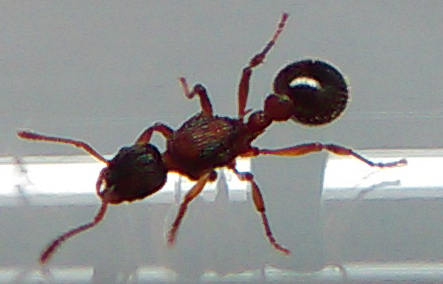 Once I know all the wild-caught colonies are adapting well to captivity, I plan to list them (except the Ponera. I'm keeping those). Currently no plans to keep the Myrmica, though they eat like champs, and probably would be easy enough. It's fine though. I'm sure if I change my mind, I could probably just go raid more acorns for more later. - (7-13-17) Maya is up to 5 workers. They're all pretty skittish, so it's hard for me to get pics. Every time I try, as soon as any sort of brighter light hits them they're like ASDFGHJKL and try and grab brood and run. ^^; So as much as I want to take pics, I have refrained from doing so. Maybe once they settle down a little, I can. One or two seem to have taken charge of being the foragers, since I see them with the biggest gasters. I left them a piece of mealworm, and one of them dragged it into the formicarium. They're still working on it. Hope they at least remember to dump it back into the outworld when they're done. I can take the lid off the formicarium, but I'd like to avoid doing so. As long as it doesn't get moldy, I guess. Meanwhile, I've made the S. molesta a small grout formicarium in a small plastic cylinder (it's a bead container). I'm trying to "persuade" them to move into it right now, but they don't seem too fazed by the light at the moment. Their test tube is rather icky already, from both the dirt I picked up from capture and the fact that their favorite thing to eat at the moment seems to be wet dog food. I'd much rather them be in a slightly bigger set-up that's easier for me to put their food on a small piece of foil to keep it clean. The Ponera are still alive, despite the fact that I've never once seen them eat anything I've offered them. Guess that means maybe they are still eating at least some of it? Either way, I get paid tomorrow, so I'll be ordering some tiny wingless fruit flies for them (and the other ants too). I can also stop by Petsmart and grab some small crickets for the bigger ants. I plan on freezing the latter for ease of use. That'll give all the ants a bit more variety besides mealworms. Once the colonies get big enough, I can consider keeping dubia roaches, but I'm no where near needing them just yet. Oh yeah, I put in a thing to get listed on the GAN site. Here's hoping I get accepted! I just have the Myrmica and Temnothorax for now, but I'll have other species soon enough. TBH, the fruit flies aren't for my Camponotus, but the smaller species like my Ponera, and probably my Tetramorium when the first workers appear. I'm probably going to get the D. melanogaster species. I can check Petsmart, but pretty sure they only sell the bigger D. hydrei ones. I'll most likely have to order the other species online, but I've already found a good site. Luckily, my Camponotus aren't picky. They've been quite happily munching on the half of a mealworm I gave them a few days ago. I think the smaller fruit flies will still work for the tiny nanitics though, so I'll probably toss some their way too. I figure I'll mix things up for them. I've read the smaller fruit flies produce much faster, so what people have done is shaken adults out and put them in a container in the freezer to keep for longer periods of time, which sounds perfect to me. - Camponotus are doing well. Maya's nanitics don't seem to be picky, and have eaten anything I've given them so far, though seem to favor the mealworms. Terra has a pupa, so she's catching up. Freya might have one too, but she's moved her brood where it's too hard to see, and stands over them. The bead container formicarium do have their downsides. - Lasius umbratus queen #2 didn't make it. She was acting really strange beforehand, running in circles. Wondering if she was sick or something. Pity, since it seemed she was getting along with the workers after she finally killed the one causing problems. - I plan on releasing the Solonopsis molesta once weather permits. They are just too tiny and hard to manage. - I broke down and bought D. hydrei fruit flies at Petsmart after seeing how cheap they were for a culture, only $6.99, and there was a good mix of adults and larva (looks like I'll be able to use your advice after all, xTNxANTMANx ). I gave them to all my current colonies. It looks like I finally found something the Ponera will eat! I dropped some in at night, and the next morning, I saw they'd been moved closer to where the larva are kept. They seem to be doing well. Still hoping to find other food sources for them, just to be able to mix things up and provide proper nutrition. The Myrmica aren't picky, but also do seem to like the smaller fruit flies. Thankfully, most of these are still founding queens. Really looking forward to the Formica getting nanitics. She's on my "species I really want to keep" list. Congratulations on Maya's first workers and Terra pupae. My Iridomyrmyx queen "Suzy" got her first nanitic yesterday aswell! It's really a very exiting time for antkeepers at this early stage. It's a lot of fun! They're really cute, and amusing to watch. Couldn't agree more! I've been watching a few videos of them drinking honey for hours!